This work was made inspired by the sculpture Germans Eagle of W. Lemke; the original sculpture was placed on the roof of the Tempelhof Airport in Berlin 1940. Today, just the head of the whole sculpture stays on the postament a front of the same Airport. In the time of the Third Rich, the sculpture was its symbol. But after that, in the time of the cold war, the airport Tempelhof was Berlin's only contact with the world, so the same sculpture became the symbol of the "Air Bridge". It affects to change its demonized history in symbol of humanity aid and link between the nations. This is the first map of Macedonia in its geographical and ethnic borders drawn by a Macedonian. Chupovski made this map as an addition to the Memorandum sent to the Great Powers and their ambassadors priori to the political division of Macedonia in 1913. 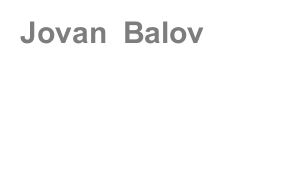 It was meant to show that Macedonia represented a geographical and ethnical whole, and that its division would be the greatest tragedy that could befall the Macedonians. 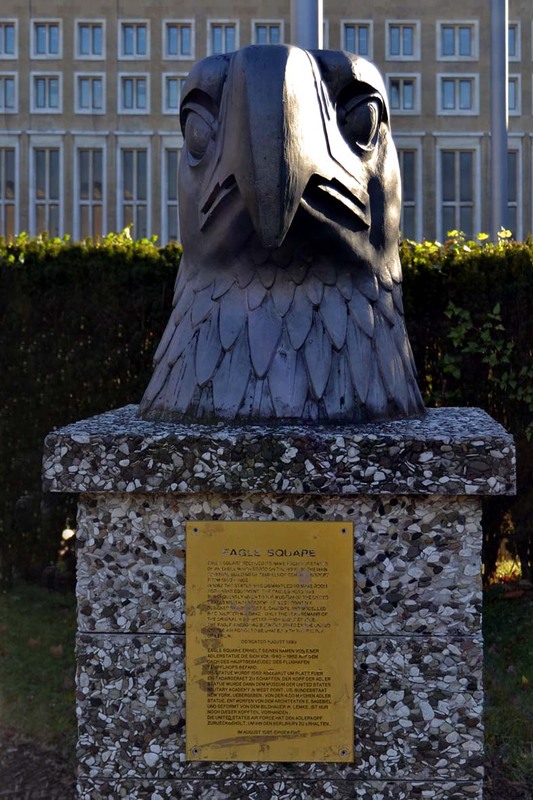 Eagle square received its name from the statue of an eagle which stood on the roof of the main terminal building of Tempelhof Central Airport from 1940 - 1962. In 1962 the statue was dismantled to make room for radar equipment. The eagle's head was subsequently given to the museum of the United States Military Academy at West Point N.Y. Designed by architect E. Sagebiel and modelled by sculptor W. Lemke. 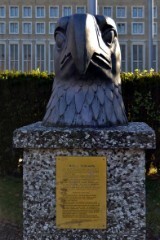 Only the head remains of the original 4.50-meter-high eagle statue. 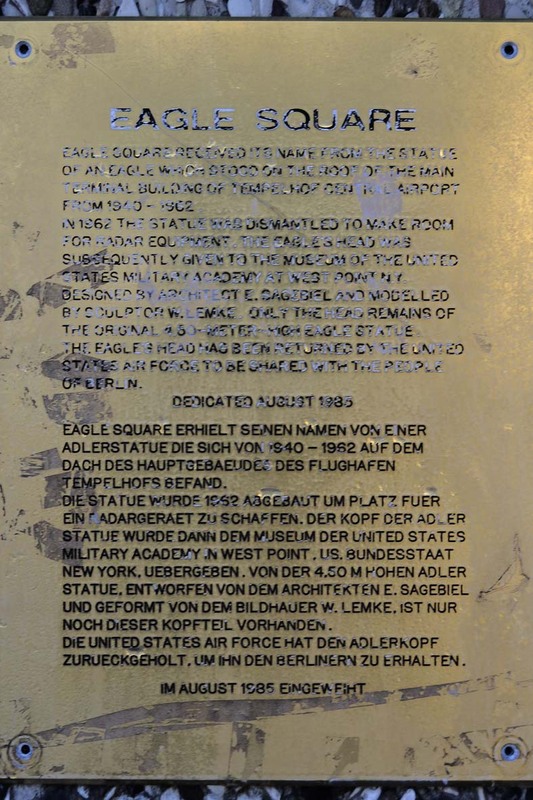 The eagle's head has been returned by the United States Air Force to be shared with the people of Berlin. Dach des Hauptgebaeudes des Flughafen Tempelhofs befand. 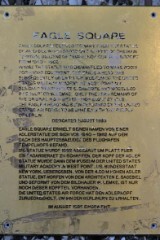 Die Statue wurde 1962 abgebaut um Platz fuer ein Radargeraet zu schaffen. Der Kopf der Adler statue wurde dann dem Museum der United States Military Academy in West Point, US. Bundesstaat New York, uebergeben. und geformt von dem Bildhauer W. Lemke, ist nur noch dieser Kopfteil vorhanden. Die United States Air Force hat den Adlerkopf zurueckgeholt, um ihn den Berlinern zu erhalten.